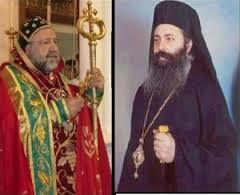 Patriarch John X (Yazigi) of Antioch and All The East, the primate of the Greek Orthodox Patriarchate of Antioch and All The East, installed on February 10, 2013, made a plea to the international community for the release of the two kidnapped Syrian Orthodox bishops, Syrian Orthodox, Bishop Yohanna Ibrahim and Greek Orthodox Archbishop of Aleppo Paul, brother of Patriarch John of Antioch and All The East, who were abducted en route to Aleppo from a town on the Turkish border on April 22. “Fanaticism has reached such an extent that Christian and Muslim spiritual leaders become the target of abduction and violence,” John of Antioch said. “Today, from this sacred and historic pulpit, we call again everyone and the international Community to act for their immediate release,” he said and added the need for “peaceful resolution of the crisis in Syria by means of dialogue”. John of Antioch is paying his first official visit to the Fener after his election. Patriarch Bartholomew I of Constantinople also referred to the extremely sad incident of the abduction of the two bishops.